The Aztecs were Native American people who lived in Mexico. They ruled the Aztec Empire from the 14th to the 16th century. They called themselves Mexicans or Nahua. The Aztecs spoke the language of Náhuatl. Some parts of the Aztec culture used human sacrifices and the belief in mythical creatures. The Aztecs had an accurate calendar which consisted of 365 days. They also had a religious calendar which was made up of 260 days. Their main sport was called Tlachtili; a game played using rubber balls and vertical hoops on opposite walls in the middle of the court. The objective of the game was to shoot the ball into the hoop using their knees and the first team to score, won the match. The Aztec capital was Tenochtitlan, built on an island in the ancient Lake Texcoco. Tenochtitlan was one of the greatest cities of the world in that time. The Aztecs believed in several gods. 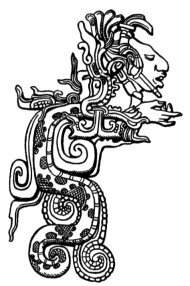 Quetzalcoatl (feathered snake), Huitzilopochtli (hummingbird of the south) and Tezcatlipoca (smoking mirror) were the most important ones. The Aztecs believed that the gods had created them and human sacrifice was the most powerful way of giving back the gift of life. The Aztecs also believed that the gods were in an almost eternal struggle. The hearts and blood from the sacrifice fed the good gods to give them strength to fight the evil gods. The human sacrifices took place on the great pyramid temple. Between 1519 and 1521 the Spanish leader, Hernán Cortés, allied with Tlaxcala and other enemies of the Aztecs, defeated them and took their empire. Some Aztecs did not want to fight against the soldiers of Cortés, because they thought they were gods. The Aztecs ate plants and vegetables that could grow easily on Mexican area. The main food was corn, which they called maize. Another food that they ate was squash. Aztec markets sold fruit, vegetable, spices, flowers, dogs, birds and cocoa beans. They also created chocolate, but they didn't have sugar and their chocolate was just a strong liquid that today you would not call tasty. These foods later spread around the world. Aztec social structure was a hierarchy divided into five levels. At the top was the Emperor, also known as the leader of the Aztecs. Underneath that level were the nobility and the priests. These people made up about 15 percent of the population and had most of the power and riches. All of these people were in the noble class. The rest of the people were the merchants, artisans, soldiers, farmers, fishers, women, and slaves. They were also known as the commoners. Merchants traded goods for the Empire. Farmers grew crops, artisans made craftworks, with feathers, such as headdresses, tunics, and fans. Slaves did what they were told to do by their owners. People of the Aztec group were allowed to move into a higher level in the social structure with their own work and effort. Aztecs also had a lot of harsh punishments for crimes that seem simple to us now. For the following crimes the punishment was death: adultery, wearing cotton clothes (if you were a commoner), cutting down a living tree, moving a field boundary making your land bigger, making someone else's smaller, major theft and treason. Today many Mexicans have Aztec and other Native American forefathers. People still use Aztec symbols in Mexico. On the Mexican flag there is a picture of an eagle on a cactus with a snake in its mouth. This was an Aztec symbol. Also the name Mexico is an Aztec word. This page was last changed on 10 December 2014, at 17:24.